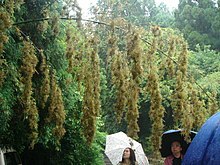 Bamboo blossom is a natural phenomenon in which the bamboos in a location blossom and become hung with bamboo seeds. Its commonly found in China, Myanmar and India. Bamboos usually have a lifecycle around 40 to 80 years, varying among species. Normally, new bamboos grow up from bamboo shoots at the roots. At infrequent intervals for most species, they will start to blossom. 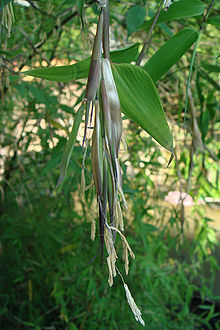 After blossom, flowers produce fruit (called "bamboo rice" in parts of India and China). Following this, the bamboo forest dies out. Since a bamboo forest usually grows from a single bamboo, the death of bamboos occurs in a large area. Many bamboo species flower at extreemly long intervals such as 65 or even 120 years. These taxa exhibit mass flowering (or gregarious flowering), with all plants in a particular cohort flowering over a several-year period. Any plant derived through clonal propagation from this cohort will also flower regardless of whether it has been planted in a different location. The longest mass flowering interval known is 130 years, for the species Phyllostachys bambusoides (Sieb. & Zucc.). In this species, all plants of the same stock flower at the same time, regardless of differences in geographic locations or climatic conditions, and then die. The lack of environmental impact on the time of flowering indicates the presence of some sort of "alarm clock" in each cell of the plant which signals the diversion of all energy to flower production and the cessation of vegetative growth. This mechanism, as well as the evolutionary cause behind it, is still largely a mystery. One hypothesis to explain the evolution of this semelparous mass flowering phenomenon is the predator satiation hypothesis, which argues that by fruiting at the same time, a population increases the survival rate of their seeds by flooding the area with fruit. Therefore, even if predators eat their fill, seeds will still be left over. By having a flowering cycle longer than the lifespan of the rodent predators, bamboos can regulate animal populations by causing starvation during the period between flowering events. Thus, the death of the adult clone is due to resource exhaustion, as it would be more effective for parent plants to devote all resources to creating a large seed crop than to hold back energy for their own regeneration. Another hypothesis, called the fire cycle hypothesis, argues that periodic flowering followed by death of the adult plants has evolved as a mechanism to create disturbance in the habitat, thus providing the seedlings with a gap in which to grow. This argues that the dead culms create a large fuel load, and also a large target for lightning strikes, increasing the likelihood of wildfire. Because bamboos can be aggressive as early successional plants, the seedlings would be able to outstrip other plants and take over the space left by their parents. However, both have been disputed for different reasons. The predator satiation hypothesis does not explain why the flowering cycle is 10 times longer than the lifespan of the local rodents, something not predicted. The bamboo fire cycle hypothesis is considered by a few scientists to be unreasonable; they argue that fires only result from humans and no natural fires occur in India. This notion is considered wrong based on distribution of lightning strike data during the dry season throughout India. However, another argument against this is the lack of precedent for any living organism to harness something as unpredictable as lightning strikes to increase its chance of survival as part of natural evolutionary progress. The mass fruiting also has direct economic and ecological consequences, however. The huge increase in available fruit in the forests often causes a boom in rodent populations, leading to increases in disease and famine in nearby human populations. For example, devastating consequences occur when the Melocanna bambusoides population flowers and fruits once every 30–35 years around the Bay of Bengal. The death of the bamboo plants following their fruiting means the local people lose their building material, and the large increase in bamboo fruit leads to a rapid increase in rodent populations. As the number of rodents increases, they consume all available food, including grain fields and stored food, sometimes leading to famine. These rats can also carry dangerous diseases, such as typhus, typhoid, and bubonic plague, which can reach epidemic proportions as the rodents increase in number. The relationship between rat populations and bamboo flowering was examined in a 2009 Nova documentary Rat Attack. The sudden death of large areas of bamboo puts pressure on animals that depend on bamboo as a food source, such as the endangered giant panda. 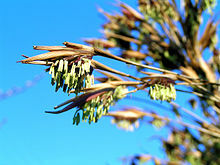 Flowering produces large quantities of seeds, typically suspended from the ends of the branches. These seeds give rise to a new generation of plants that may be identical in appearance to those that preceded the flowering, or they may produce new cultivars with different characteristics, such as the presence or absence of striping or other changes in coloration of the culms. ^ a b Soderstrom, Thomas R.; Calderon, Cleofe E. (1979). "A Commentary on the Bamboos (Poaceae: Bambusoideae)". Biotropica. 11 (3): 161–172. doi:10.2307/2388036. JSTOR 2388036. ^ Keeley, JE; Keeley, J.E. ; W.J. Bond (1999). "Mast flowering and semelparity in bamboos: The bamboo fire cycle hypothesis". American Naturalist. 154 (3): 383–391. doi:10.1086/303243. PMID 10506551. ^ Saha, S; Saha, S.; HF Howe (2001). "The Bamboo Fire Cycle Hypothesis: A Comment". The American Naturalist. 158 (6): 659–663. doi:10.1086/323593. PMID 18707360. ^ Keeley, JE; Keeley, J.E. ; W.J. Bond (2001). "On incorporating fire into our thinking about natural ecosystems: A response to Saha and Howe". American Naturalist. 158 (6): 664–670. doi:10.1086/323594. PMID 18707361. ^ "muli bamboo (plant) - Encyclopædia Britannica". Britannica.com. Retrieved 2014-03-24. ^ Bedi, Rahul. "Rat boom threatens hunger for millions". New Zealand Herald. Retrieved November 18, 2006. ^ "Bamboo Blossom Won't Cause Panda Extinction: Expert". People's Daily. Retrieved August 20, 2001. ^ K. K. Seethalakshmi; M. S. Muktesh Kumar; K. Sankara Pillai; N. Sarojam (1998). Bamboos of India – A Compendium (PDF). BRILL. ISBN 9788186247259.